The Milescraft AngleFinder is a reference for angle measurements for precise woodworking. Looking to divide your angle in half for miter saw set-up? Look no further, the AngleFinder does all the work for you. The yellow angle divider divides any angle in half or finds angles between two points on inside or outside corners. The AngleFinder features an angle measurement readout, allowing you to set your angle once determined. 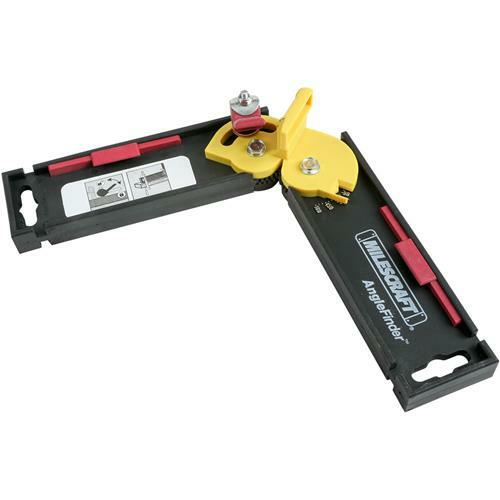 The locking lever secures your angle in place while transferring it to your miter saw. Looking to find an angle in a tight spot? The retractable edge guides allow you to get into confined spaces and determine the angle.